Overlay (far-Western) assays demonstrating the interaction between FLCs and THP. (A) Coomassie-stained gel (left) depicts the monomeric and dimeric forms of a monoclonal FLC and the VL domain, which had been enzymatically cleaved from the FLCs. The adjacent blot (right) demonstrates that human THP bound to monomers, dimers, and polymeric FLCs, as well as the VL domain of the FLCs. 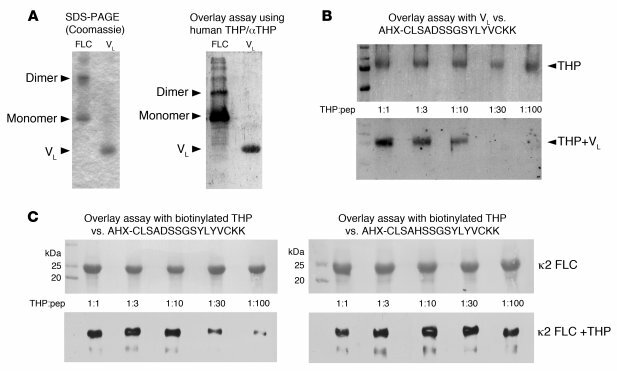 (B) Results of an experiment that used cyclic peptide 1 (AHX-CLSADSSGSYLYVCKK) to compete with the biotinylated VL domain of FLC ITPBLL86 for binding to THP immobilized onto PVDF membrane. The reversible protein stain demonstrated the presence of THP in each lane (top). Addition of increasing molar amounts, relative to THP, of the cyclic peptide prevented binding of the VL domain to THP. (C) Results of an overlay assay that used cyclized peptide 1 (AHX-CLSADSSGSYLYVCKK) or a cyclized control peptide (AHX-CLSAHSSGSYLYVCKK) to compete with biotinylated THP for binding to κ2 FLC immobilized onto PVDF membrane. The reversible protein stain demonstrated the presence of κ2 FLC in each lane (top). Cyclized peptide 1, but not the cyclized control peptide, dose dependently inhibited binding of THP to the κ2 FLC (bottom).